That title, if it really needs to be confirmed, is ironic. Michael Haneke is modern cinema’s tomb raider of abject gloom. His camera is minutely calibrated to capture human suffering, and also the humans who precipitate that suffering. And then, on top of that, you have what we might term “ambient suffering”, which is an entirely natural, non-man made form of suffering that comes part and parcel with the burden of human sentience. His intriguing and oblique new puzzle film presents this suffering in all its disparate forms, and focuses particularly on how it has manifest within the ranks of an affluent family of costal French industrialists, the Laurents. Ice cold Anne (Isabelle Huppert) is head puppet master, pacifying members of the clan and keeping business dealings bubbling over. Brother Thomas (Mathieu Kassovitz) is bunking over with his depressed daughter Eve (Fantine Harduin), whose mother (his ex-wife) is critically ill in hospital. Family black sheep Pierre (Franz Rogowski) vents his frustrations through gymnastic karaoke, while Anne’s cantankerous father George (Jean-Louis Trintignant) is in constant search of the title’s illusive happy end. The film follows them through their daily encounters and chronicles the painful dramas that come with co-habitation and basic interaction. Much like his 2012 Palme d’Or winner, The White Ribbon, this is about the banality of evil and our festering decline towards violence and self-annihilation. 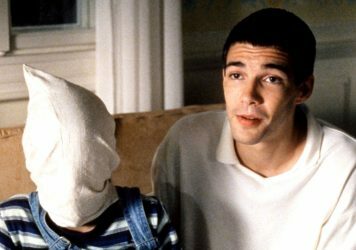 Though Haneke has dealt with the “danger” of filmed imagery in past works (notably in 1997’s Funny Games and 1992’s Benny’s Video), the new dimension here is a contemplation of how the internet and digital communication platforms help to accelerate the desecration of loving relationships. In short: Facebook is killing love. 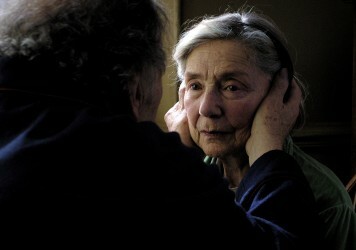 His previous film, Amour, saw an old couple condemned to deal with the grotesque process of mortality, but Haneke suggests that the possibility of love is dwindling in a world in which digital interfaces serve to thwart physical relationships. In one sequence, George shows some old photographs of his late wife to Eve, and a sentimental bond is formed. The primacy of photography retains its value – it’s when you add caption boxes and a live streaming video option that matters become more complex. As usual, Hanake stages mundane domestic scenes in a way where a sudden outburst of extreme violence should never be discounted. You watch each shot with a single thought: what could possibly go wrong here? He uses the frame in intriguing ways, planting red-herrings in the backdrop or tucked away in a corner. Anne and Thomas argue in his apartment, and a frazzled Thomas drifts ever closer towards the balcony as it’s looking more likely that Anne has him verbally pinned. This hair-trigger sensibility is the remarkable quality on which Haneke has built his kingdom, and it makes his films compelling even when (like here) there’s no conventional narrative thread. This is a film which will no doubt reward repeated viewings as a way to catch all of the subtle symmetries and to divulge the true meaning of each enigmatic scene. 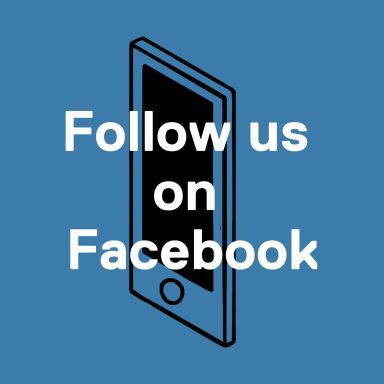 There’s one sequence where Eve wanders through a garden party and overhears random snatches of dull conversations – like a walking, talking social media feed. 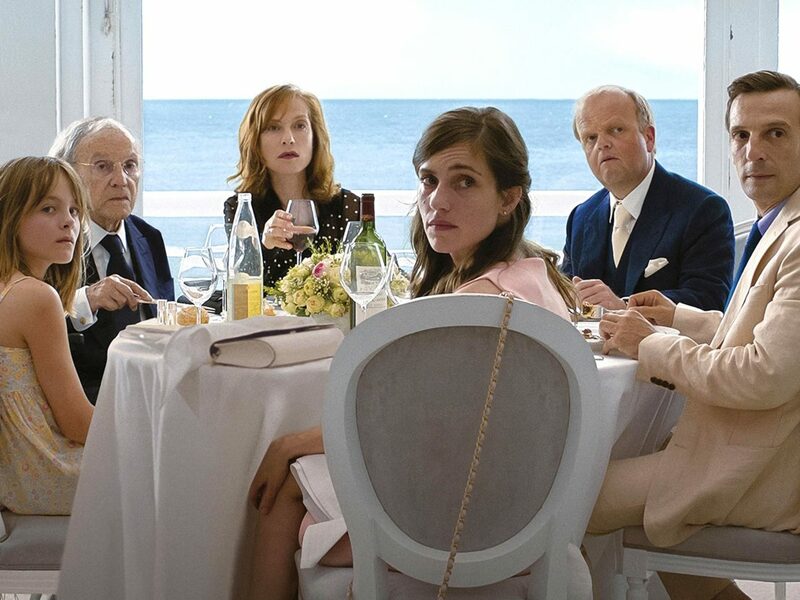 Happy End is a Haneke mega mix, and the haters are very much gonna hate. 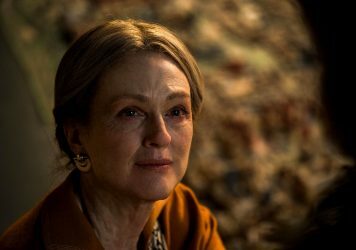 But there’s is something irresistible about the director’s hostile precision and the way in which he offers a surprise along with every lacerating cut. It’s a film about a world gradually sliding into an abyss of moral degradation, but at the same time, there are traces which make you think that Haneke secretly believes it’s a world worth saving.